"We knew that translating our current product to the web would require a ﬁrm that could provide the technical guidance and coaching to help us make a huge paradigm shift. We did our homework and despite the fact that they were not the lowest quote, we knew they were the people we wanted to partner with. Their personal enthusiasm, agile methodology and team coaching sold us and we are thrilled that we made this choice. The Relevance Team surpassed our wildest expectations and we are amazed at what they accomplished in a short timeframe. Not only do we have an optimal ﬁrst release, we have a product that is better than we could have envisioned on our own. The daily stand-up meetings gave the project team clarity through ruthless prioritization, the team coach provided leadership, the transparent feedback helped us have a sense of completion at important milestones and on and on. Most importantly, the patience they exhibited with non-technical clients created a friendly team climate for all of us involved. In conclusion, we are raving fans of the talented people at Relevance and would recommend them to anyone." Pam Boney, Founder and CEO, Tilt Inc. 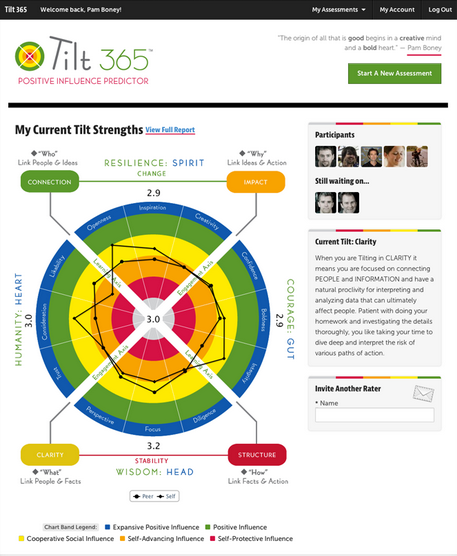 Tilt's founders had spent their careers studying the science of optimal personal performance, creating a successful model enabling individuals and teams to achieve True Tilt Leadership, a position of positive influence that creates a climate for innovation. Having been primarily limited to group trainings and face to face coaching, the time had come to dramatically scale their business to the web. Although not tech-savvy themselves, they had an ambitious vision for a first of its kind SaaS-based system that would enable users to continually improve their creative influence, guiding leaders and teams to get "in the zone." Relevance joined this partnership on many levels, from overall business model to technical architecture to front end design. The team guided Tilt's founders through the agile development process to determine and then focus on the highest value features, creating a very professional yet compellingly fun release that met the goals, budget, and timeline for the launch of their new business. Committed to long-term customer satisfaction and success, the Relevance team also helped hire and train an in-house engineering team to carry the Tilt365.com vision forward.